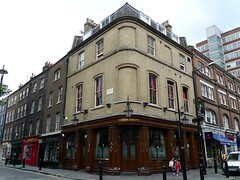 Samuel Smith's pub in Soho, named after Dr John Snow, the chap who worked out that cholera was transmitted in London's water supply (spread via a pump just outside the pub, on Broadwick Street), though he was a teetotaller. Being a Sam Smith's, the place is nicely maintained, with some original Victorian features (such as the dividing panel between the saloon and public bars, with its tiny door). Seating downstairs is fairly limited, but there's a carpeted upstairs bar as well. No handpumps for ale, but otherwise the usual Sam Smith's selection. Last visited by Ewan and others, 18 July 2008. Last edited 2011-06-26 14:24:16 (version 10; diff). List all versions. Page last edited 2011-06-26 14:24:16 (version 10).